Winter break is at the half way point, and by now you're tired of the siblings being at each others' throats and you're ready for a little space. That can make the cries of "I'm bored" even harder to handle. While you're all ready for a little space, tweens still crave your undivided attention. Family game night is a great way to give it to them, and it is also a fantastic way to spend New Year's Eve as a family. I know that family game night is not a new concept. But game night is a classic because it is fun, inexpensive, creates some fun memories, and is a great way to bond. Try a few fun twists to keep family game night fresh and fabulous. Ring in the new year with some new takes on old classics. 1. Make your own 2012 Retrospective Memory. Select your favorite photos from the past year, and have the kids pick some of their favorites as well. Are you surprised by their selections? Once the pics are chosen, print out 2 copies each photo on regular paper, lay them out in an array picture side down and you can all play Memory. Creating the game is a boredom buster itself, with the selection and printing of the pictures. It may be worth gluing or taping the pictures to uniform pieces of construction paper both make size easier and prevent any peeking through the back. A large assortment of photos will mean more crafting by the kids and more playing time. When playing the game, once each family member makes a match, they need to say what they remember from that day. and, God help me, "Gangnam Style." Another option is to mix in some goals or family events coming up in 2013. 3. Beach-themed game night. There's Christmas in July, why not have August at New Years? If your weather is anything like it is here, the gray, dreary permacloud may be starting to get to you. Fight the winter blahs by cranking up the heat (nope, this idea is not the most environmentally friendly). Make some fruity drinks, or whip up a mocktail like a virgin margarita if you are so inclined. Tell the kids to put on their shorts or sundresses, spread out some beach towels or blankets, and have a fun in the sun party. Play beach blanket bingo! As we've discussed, Bingo is a big hit with all ages. Do charades with a summer activities theme. 4. Divide and conquer and be silly! Get out the aggression that's been building within the family. Break out a few decks of cards and have simultaneous games of war, and then rotate players. My family has found it great fun to yell "Waaaaarrrrr!" when the occasion strikes. Pairing off like that gives feuding family members a little bit of a break from each other, and gets some parent-child time. Or have a couple other 2-player games in the rotation, such as Battleship. When a player sinks a battleship, let them do a happy dance or a victory lap around the kitchen. Even those little twists can give a game new life and help burn off some of the energy built up over break. Our other boredom busters can be fun ways to celebrate New Year's Eve, too. Have a kids' party, let the children make dinner, or host craft night. 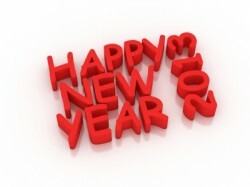 Tween Us is grateful for your readership in 2012 and wishes you and your family health and happiness in the coming new year! You can help us start 2013 on a high note by liking us on Facebook. What plans does your family have for celebrating the end of 2012 and ringing in 2013?